‘Britain’s oldest living dog,’ a 27-year-old Border Collie named Bramble (picture available in Creation magazine), was reported as having thrived on a diet of rice mixed with lentils and vegetables. Bramble’s owner, Anne Heritage, is a vegan and raised her pet on the same diet. The Sunday Mail (Queensland), 29 September 2002, p. 51. In the light of this and other accounts of carnivorous animals surviving on vegetarian diets (e.g. The lion that wouldn’t eat meat, Creation 22(2):22–23), it is easy to relate to the Genesis account of animals, before Adam sinned, eating only plants (Genesis 1:30). With the left side of her brain crushed and rendered clinically dead by an accident, doctors warned Sarah Kemp’s family that if she ever came out of the coma—which they thought unlikely—she would be blind, deaf, paralyzed, and brain damaged. But three years later, Sarah, now 24, can see, hear, talk, and is able to walk again, having relearned a sense of balance, gait, and posture. Though she retained much of her memory—including details of the accident—Sarah had to relearn the difference between offensive and polite behaviour, and though able to read and remember how to hold a pen, she was frustrated by being completely unable to write. When, a few weeks later, her hand suddenly began to comply, ‘as if someone had snapped their fingers and I started writing again,’ doctors explained that her brain had suddenly found a new path back to the part that knew how to write. Daily Mail (UK), 27 August 2002. Like the case of the girl who had the left hemisphere of her brain removed at age three (She ain’t half brainy, Creation 24(4):7), this again demonstrates the body’s fantastic capacity to compensate for loss. This is an enigma for evolutionists, as natural selection can only select traits necessary for immediate survival. Such brain injuries would have been fatal in the circumstances in which humans were supposed to have evolved. British chimpanzee expert Dr Jane Goodall is among several leading animal rights activists campaigning for the great apes to be afforded the same legal status as humans. But Frodo the chimpanzee, one of Dr Goodall’s subjects of 40 years’ study in Tanzania, and the star of many acclaimed documentaries as well as the recent Imax movie Wild Chimpanzees, presents ‘a macabre yet compelling ethical dilemma.’ Frodo is a murderer. In mid-2002 he pounced on Mrs Moshi Sadiqi as she was collecting firewood, snatched her 14-month-old daughter from her back (where she had been strapped in a sling), and carried the child high into the trees. Frodo then battered her repeatedly against tree branches until she was dead. The Tanzanian National Parks Department has decided the superstar chimp will not be held accountable and will certainly not be punished. The Sunday Mail, 7 July 2002, p. 20. Apart from humans, it seems California sea lions might have the best memory. In 1991, a female named Rio was taught a trick involving letters and numbers, and when tested again in 2001, she did it perfectly—despite not having performed the trick in the intervening ten years. It is thought that for an animal to learn concepts such as ‘sameness’—e.g. when a letter or number matches another—sophisticated brain processing is necessary. So scientists expect animals to have trouble remembering things unless frequently reminded. While primates (e.g. the Rhesus Macaque) have quite impressive long-term memories, the ability of Rio, the sea lion, outshines them. New Scientist, 26 October 2002, p. 25. Meanwhile, the profound differences between their mental capacities and ours reinforces the biblical truth that man is not just another animal, but made in God’s image and placed as the federal head of Creation. Radioactive dating of volcanic rocks in Quebec has surprised geologists, who had earlier estimated that the rocks were ‘only’ about 2.8 billion years old. New estimates from latest analysis add a billion years to their age, enabling geologists to claim that, at 3.825 billion years old—give or take 16 million years—these are the oldest volcanic rocks in the world. BBC News, <news.bbc.co.uk/1/hi/sci/tech/2546019.stm>, 5 December 2002. So the first estimate was one billion years out, yet each time one is supposed to accept the dates as ‘authoritative’? See Radio-dating in rubble, Creation 23(3):23–25. We have often explained that no information-increasing mutation has been observed, but some information-losing changes can be beneficial (helpful). A well-known one is sickle-cell anemia. This mutation ruins hemoglobin so it becomes misshapen, and can’t carry oxygen as efficiently. But it also means that the malaria parasite can’t multiply in the red blood cells. So people who have both the normal and sickle-cell gene (heterozygous) have inefficient blood, but are resistant to malaria. Therefore, natural selection would keep the sickle-cell gene in the population in malarial areas. But, as we reported from a world expert in sickle-cell anemia, this is not evolution, because there is no new information (Creation 16(2):40–41, 1994). Now, a mutation in another gene helps protect against malaria. This is in a switch that turns on the enzyme to produce nitric oxide (NO). This lowers the risk of severe malaria by 88% in Tanzania and 75% in Kenya. Though the researchers don’t know how NO works, people with this mutation are less likely to die of malaria, so they are more likely to pass on this mutation to their children. So natural selection would favour this gene in malarial areas. In non-malarial areas, there would be no need for this extra NO production, so the mutation would tend to be lost. Science, 15 November 2002, pp. 1317–1319. Here again, the mutation doesn’t turn on any new information, but switches on already existing information. ‘The Big Room’ at Carlsbad Caverns is a cave more than six football fields in area and reaching 30 stories high. For many years, visitors were told that the relentless dripping of carbonic acid, seeping down to the limestone from rain runoff, had slowly eaten away all that rock. But a ‘nagging puzzle’ for geologists was: where did the limestone go? Carlsbad has no underground streams or other subterranean escape route. Bacteria feeding on carbon compounds in oil beneath the Carlsbad region would have generated hydrogen sulfide. As this percolated upward to meet water and air, sulfuric acid was formed, ‘which can dissolve whole stadiums of limestone.’ The by-product of this reaction is gypsum, thus explaining the large blocks of gypsum evident throughout. The Cincinnati Post, 13 December 2002, p. 27A. The sheer size of many caves speaks of large-scale (and rapid) processes shaping them, not the slow drip-drip-drip of rainfall seepage over millions of years. The cataclysmic inundation by the global Flood no doubt set the scene for underground pockets of limestone to be dissolved and carried away, leaving hollowed-out rock behind. (See Rapid Cave Formation by Sulfuric Acid Dissolution, Journal of Creation 12(3):279–280.) Stalactites and stalagmites were obviously formed after water levels subsided in the caverns, and, as we have shown many times, do not need millions of years to form. The discovery of living bacteria floating in the stratosphere, 41 km (25 miles) above the earth’s surface, is being claimed as evidence for the idea that life here began when this planet was seeded in the past by microorganisms from space. ‘The findings support the idea … that comets not only brought the first living microorganisms to earth 4 billion years ago but that they must also be doing that at the present time,’ said Cardiff University’s Chandra Wickramasinghe, a co-author of the theory. Cardiff University press release, <www.sciteclibrary.com/eng/catalog/pages/4327.html>, 14 January 2003. United Press International, <www.upi.com/view.cfm?StoryID=20021216-052639-6668r>, 14 January 2003. The microbes appear to be the same as those found on earth, which has led others to put forward the more plausible hypothesis that these were wafted up 41 km from the earth, not brought in from trillions of km away by comets. The difficulty of explaining how the first microorganism arose on earth leads many to explore for life in space, but this merely shifts, not solves, the problem. For example, NASA pays out US$3 million to other researchers/agencies as part of its continuing research into ‘the Genesis questions.’ Other organisations, such as the Smithsonian Institute and the National Science Foundation, also invite annual applications for grant money for origins research. 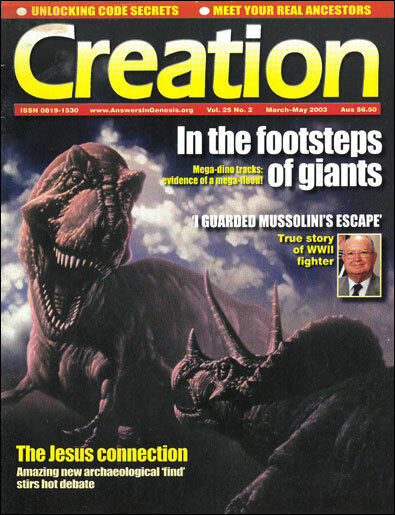 The Scientist, 25 November 2002, p. 54. Despite the fact that origins and evolution are admitted to be unknowns, funding opportunities ‘abound’ for research into evolutionary and other anti-God ideas. By way of contrast, creationist scientists struggle against institutional bias. This is not just in relation to funding, but also when they are seeking to publish their research in secular scientific journals. The bacterium Deinococcus radiodurans can withstand huge doses of radiation, far in excess of natural levels on Earth. This has mystified evolutionists; how could evolution equip a creature for conditions it has never experienced? Now Russian researchers claim that it evolved on Mars, where radiation levels are much higher. Later, it was carried to Earth aboard bits of Martian rock blasted into space by impacts. Some have tried to claim that the answer is a ‘pre-adaptation’ to dessication (drying). However, this is itself horrendously complex with strong hallmarks of design. It involves two ingenious DNA repair systems, and other useful features. New Scientist, 28 September 2002, p. 16. The only substantiated cases of a mule giving birth in recent history were in China (1988) and another in Morocco (1984). Since 1527 there have only been 60 reported cases of mules giving birth. How this can occur is something of a mystery, as a horse has 64 chromosomes and a donkey has 62, leaving a mule with 63, an uneven number, which cannot divide into chromosome pairs. BBC News, <news.bbc.co.uk/2/hi/sci/tech/2290491.stm>, 31 October 2002. While the genetics may not yet be fully understood, the fact that donkeys and horses readily hybridize with each other and with zebras (which have 44 chromosomes—see Creation 24(1):9) indicates that all these Equus species and their offspring (mule, hinny, zorse, zeedonk, zonkey, zebrass) are descendants of the one created kind that came off the Ark. The occasional fertile hybrid strengthens the case. An orangutan filmed for the television series The Life of Mammals imitates local villagers by sawing wood, using soap to wash herself, and using their canoes. The Daily Mirror, 26 November 2002, p. 15. But Attenborough should know that biological evolution is supposed to be about changes in genes, i.e. inherited changes, not learned behaviour. Imitated behaviour does not lead to changes in the makeup of an organism or its DNA.